At 1:30pm yesterday (Mar 29) at the Phuket City Municipality Meeting Room, Phuket City Mayor Somjai Suwanasupphan together with Deputy Attorney General of the Office of Litigation at Phuket City Municipality Bantoon Thongtan held a meeting to donate B1.36mn for medical equipment at the upcoming Chalong Hospital. Mayor Somjai noted that Chalong Hospital will be a community hospital featuring 36 beds and will accommodate patients from Chalong, Rawai, Karon and neighbouring areas before transferring them to Vachira Phuket Hospital. Doctors and nurses from Vachira Phuket Hospital and Thalang Hospitals will provide services at Chalong Hospital, she noted. “The government, private sector, people, and local government agencies in Phuket recognise and give priority to providing assistance to other human beings. Therefore, we jointly fund the purchase of equipment for Chalong Hospital. “Part of the support was given to Chalong Hospital through the organisation of a walking and running event on Feb 11 at Nai Harn’s public park in Rawai, from which B10mn was donated for the hospital,” she said. “Phuket City Municipality as a local government organisation responsible for caring for people from birth to death. It has the authority to promote the health of the people by working with Vachira Phuket Hospital, a network partner, to work together in all ways. “In terms of treatment, promotion, rehabilitation and prevention, it recognises the importance of public health service provisiond,” she added. “Therefore, the donation to finance the purchase of these medical devices is what Phuket City Municipality can take care of,” she said. 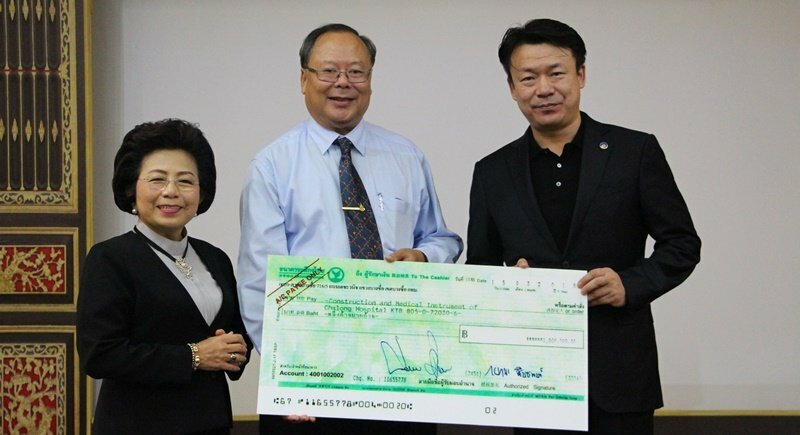 “Phuket City Municipality is sponsored by PJT Technology Co Ltd, who contributed B1mn, Phuket Fishing Club who contributed B146,900, Eastern Thai Consulting 1992 Co Ltd who contributed B100,000, Phuket Rock Partnership who contribute B50,000, Diamond Thalang Ltd and Coral Island Resort Co Ltd who contributed B45,000, and Sompong Mineral Limited Partnership and its relatives amounting to B20,000.